The Interactive Mapping of e-WV is one of the most powerful, and most daunting, features of the website. 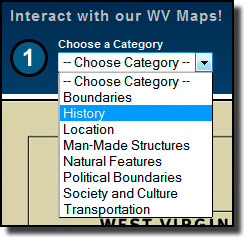 There are over 120 individual maps in e-WV, but these are divided into categories and map sets to help the user sort them. Following a straightforward 1-2-3 procedure will allow you to master Interactive Mapping. 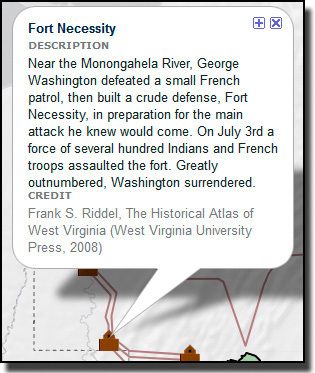 First select “History” as the Category, and then choose “The French and Indian War, 1753-1763” and click Show Map. The map displayed includes a legend (Map Layers) to the right; each layer includes a plus sign, the symbol for items of that layer, and a box that is already checked. If you uncheck the box, that layer (and all its elements) disappears from the map, so you can select which mapped items you would like to display. If you click the plus (+) sign, it breaks that layer into the individual elements. Click “Forts” and you see the names of the individual forts. If you click the circle next to a fort name, a box pops up over the map that tells some information about the element, and perhaps even includes a link to an article for more information about that element. That pop-up box also has an X (to close the box) and a plus (+) sign. 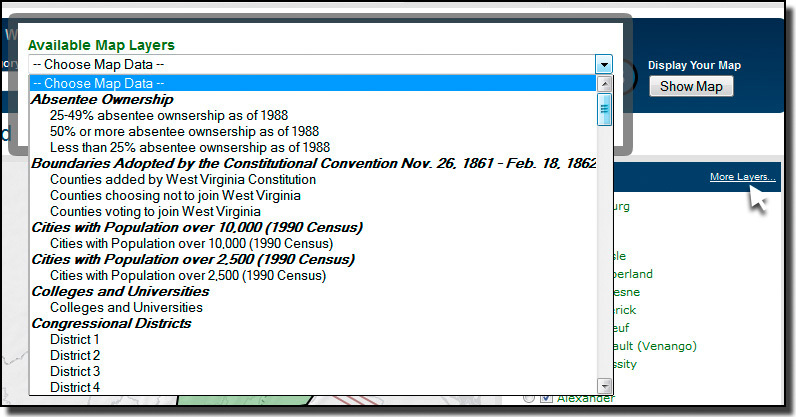 Clicking the plus sign initiates a search on that term or phrase in e-WV, so that you can find more information about it right from the Interactive Mapping. The user has access to more maps at this point. At the top of the legend is a link that says “More Layers.” Clicking this allows the user to add any of the other map layers to this map. 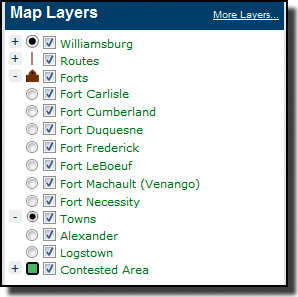 Obviously some layers, such as “Cities with Population over 10,000,” have no relation to The French and Indian War but selecting the map layer “Forts, Stockades and Blockhouses” might be of interest. Likewise, you can add another map by clicking More Layers and selecting “Chartered Towns” to see which towns might have been settled and affected by the French and Indian War. You can continue to experiment by adding new layers and turning off layers in the legend when the map gets too busy. Some maps offer a timeline. Refresh your browser page so that you are back to the state map, then select the Category “Political Boundaries” and the map “County Development.” You are presented with a state map in blue with all 55 counties defined, and a slider at the top that goes from 1634 to 2000. If you move the slider back in time to 1634, the map changes and shows the very first counties created in the colony of Virginia. If you move forward to 1724, you see some more counties; 1735 is when the present state of West Virginia appears as a county, and if you click in the center you get an information box that tells you that Orange County (all of West Virginia and Kentucky) was created from Spotsylvania. Moving forward a few years at a time, in 1754 you see the first present-day county in West Virginia, Hampshire, appear on the map. You can continue in this way, watching the counties in western Virginia develop, until 1863, when the Virginia counties disappear from the map. 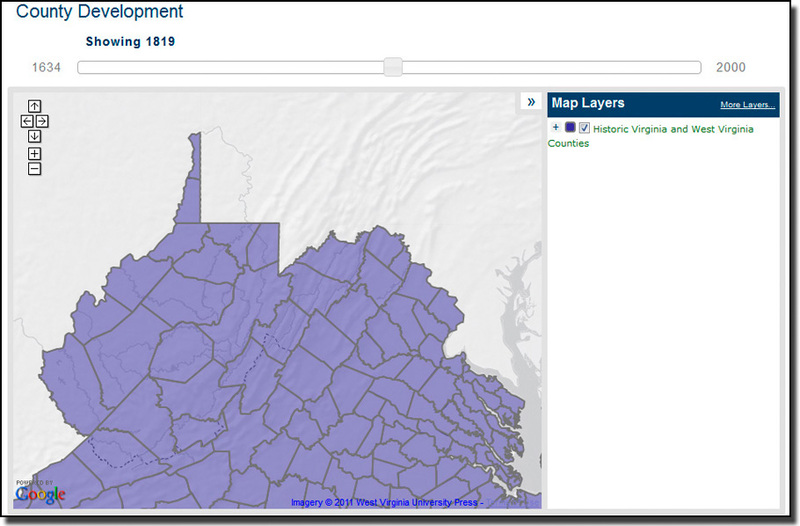 Unlike many other features of e-WV, you can’t add an interactive map to a portfolio. However, if you build a map that you would like to save, it’s easy enough to take a screenshot of it. On a Windows PC, simply press the “Prt Scr” (Print Screen key; this takes a screenshot of your monitor and saves it to the clipboard. If you have image editing software (Photoshop, Photoshop Elements, GIMP, even Windows Paint which is included on every Windows PC), open the software, create a new blank document and paste your screenshot into the document. Crop the image to just the part you want and save it to your computer or upload it to the Cloud where you can access it from any computer. If you have any questions about using Interactive Mapping, contact Mike Keller at e-WV: keller@wvhumanities.org or 304/346-8500. Care to try it? Click here to open the Interactive Maps page in a new window or tab, and then try the exercises outlined above. Just switch back and forth between this window and the new one to do the steps.